You Will Be My Witnesses: Music for Christian Initiation is a collection of new music from the Collegeville Composers Group. For use during the Rites of Christian initiation, this collection will enhance these celebrations in your faith community through accessible melodies and creative arrangements. This exciting collection includes fourteen unique selections. The Cantor/Choir Edition contains descants and harmonies while accompaniments and reprintable assembly graphics can be found in the Accompaniment Edition. Recordings are available together on one CD to assist you in learning the songs. The CD also makes enjoyable music for personal prayer and a meaningful gift for initiation candidates. 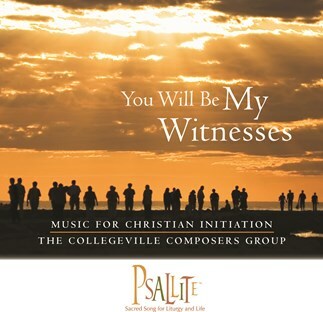 View all Psallite products by The Collegeville Composers Group here. This is, by far, the best new setting of the Ordinary I have heard or seen since the new translations were announced.